Gundog training and fieldwork for all breeds of gundog. [wp_ad_camp_2]It is some years since I first started clicker training and I have taught the clicker retrieve to quite a few dogs now. But I still remember the first time very clearly and the sense of epiphany it gave me as I realised the power and scope of the clicker trained retrieve to overcome a range of retrieving difficulties. It is not the only way of solving these problems, but I am convinced that in many cases it is the best way. Over the years I have modified and simplified my method so if you have read my original version you will find this one a little different because I now begin by teaching the dog to pick the dummy up from the floor, rather than by taking the dummy from the trainer’s hand. I have also become aware that there is one slightly tricky part of this process where people are most likely to get stuck. I have addressed this part in some detail to enable you to progress smoothly through the entire process. The clicker retrieve is not a ‘quick fix’. You will need to set some time aside for ten minute training sessions, preferably two or three times a day, but certainly at least four times a week. The whole process will probably take from one to four weeks depending on how often you train, and on what problems your dog had to begin with. 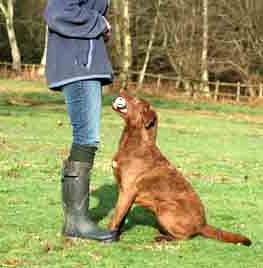 Any dog can be taught to retrieve using this method, even a dog with little or no retrieving instinct. However, the clicker retrieve is not a substitute for retrieving instinct. It probably won’t turn a gundog with no interest in retrieving into a really passionate retriever and is best used for teaching a nice smooth delivery once an enthusiastic retrieving habit has been established. They need to be taught in this order, but you can miss out the first part if your dog already picks up a dummy quite happily. I’ll be posting up each part in the weeks to come, so do check back for updates. If you enjoy my articles, you might like my new book: The Happy Puppy Handbook – a definitive guide to early puppy care and training. I have a1yr + Labrador who has delivery problems in that he comes back fairly slowly on the return, particularly in classes when he only gets 1 retrieve at a time, and will more often than not move the dummy in his mouth to the string end and then present with the dummy hanging down by the string. He then often pulls back on the string when I ask him to give! If it’s a tennis ball there is no problem. He can also chomp on the dummy a bit. Should I follow the clicker retrieve instructions from the hold part onwards, but only click when he is holding the dummy in the middle. I have taught him to hold for quite a while in front of me on the sit, so I am not sure he will want to spit the dummy out for a food treat. Also should I retrain the delivery at home in the garden, not out in a field where I do most of my training. Also could I try giving him another dummy to hold as a reward rather than food if that doesn’t seem to work with him.Finally when I give him a dummy to hold he tends to grab it hard, chomp a few times and work his way to the end again! Sorry for all of these questions! Apart from the above he is a great little retriever! Hi Pippa I have a 17 month old cocker spaniel. We have taught him to retrieve in side the house and in the garden. However as soon as we go for a walk he ignores what we say. He ignores our calling and commands. We have tried several times on and off lead in different environments but we still have no results. He has also decided that retrieving is boring and will refuse to do anything. Should I start training the retrieve again? His behaviour has become really naughty recently. The other day I asked him to come back and he came back with a dead rat and wouldn’t give it up. Hi Sophie, there are quite a few different things going on there aren’t there 🙂 Many hunting dogs would rather hunt than retrieve. Have a look at this article for help with this. Your main problem though, is your recall. Have a look at this article Spaniel out of control Control outdoors is a combination of solidly proofed recall, and good management. You need to keep your spaniel hunting close to you, or he will learn to hunt for himself. Have a read of the articles and post up if you have any questions. My dog doing well with clicker training after about 8 days. Trying to get him to focus more on me when we do recall and then C&T that. Worked through the stages at dummy retrieving, although never any problem picking it up anyway. The only problem was in a group. He has been holding it nicely and delivering it well to hand, and holding until I say dead. I know only 8 days but thought we were doing well until today when met up with a friend for a little training and he picked up the dummy, ran off and started chewing it, which he has never done before. So what’s going wrong? His behaviour is excited/naughty/possessive I suppose. Should I just persevere on my own with the clicker training and not meet anyone for a while? You don’t need to attend classes, you can do this at home on your own. If you feel a bit unsure, I suggest you start by teaching something simple that has no value. For example, you can teach a dog to touch an item you lay on the floor or to stand in a cardboard box. This lets you master the technique without putting any pressure on you and the dog to succeed. You can go straight into clicker training the retrieve but I think it probably helps to have a bit of a practice first. 3. Hold for a few seconds (never more than 2 or 3 seconds) even though I am trying to extend by not rewarding with C&T. He seems to get anxious or bored as soon as I press (don’t reward) for longer holds. So my thinking was to try and shape the fieldwork results above where if I fuss and praise he holds longer…into a delivery to hand rather than going through the 4 steps of the trained retrieve because I am stuck at step 3…? Can you help. I want to shape behaviour from where I am. Dog steady, toss dumbell or dummy; he goes out; picks up; returns. If I make a big fuss of him, petting all the while without going near his mouth, he will hold onto the dummy. Can I shape a behaviour from this? ie, to hold until I tell him “give”? Hi Lourens, what is it that you want to change? Does he spit out or turn away with the dummy if you try to take it? I’m trying some of the things in that article and have a couple yet to try, with little success for a ‘delivery’. Long story short…she is running about my feet with me tucked in a corner, I say good girl, stroke her etc etc and then ‘take it off her’, Is that what you would call a ‘manipulated one’. Hi Pippa, I’m currently reading your book “Total Recal” and really enjoying it. I found this article on the clicker retrieve as my 5.5 month pup will happily run out and get a dummy but is reluctant to hand it over. I have tried teaching the hold but she just wants to chew the dummy and I don’t want to force the hold and ruin her retrieving enthusiasm.